In the 1860 presidential campaign, he worked for the election of Abraham Lincoln, but with no great enthusiasm. After Lincoln's election at the beginning of the Civil War, Hayes wrote in his diary, "Six states have 'seceded.' Let them go." Nevertheless, when the war broke out, Hayes became active in the Union's military effort to unify the nation. In 1862 he was promoted to full colonel and given command of the Twenty-third Ohio Regiment. Hayes was wounded four times, once seriously, during the war. His composure in battle gained him the respect of those who served under him. Barnard, Harry. 1954. Rutherford B. Hayes and His America. Indianapolis: Bobbs-Merrill. Bishop, Arthur. 1969. 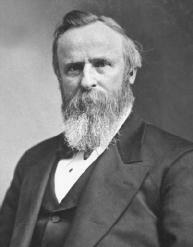 Rutherford B. Hayes, 1822–1893. Dobbs Ferry, N.Y.: Oceana. Clancy, Herbert J. 1958. The Presidential Election of 1880. Chicago: Loyola Univ. Press. Davison, Kenneth E. 1972. The Presidency of Rutherford B. Hayes. Westport, Conn.: Greenwood Press. Hoogenboom, Ari Arthur. 1995. Rutherford B. Hayes, Warrior and President. Lawrence: Univ. Press of Kansas. ——. 1988. The Presidency of Rutherford B. Hayes. Lawrence: Univ. Press of Kansas. Morris, Roy. 2003. Fraud of the Century: Rutherford B. Hayes, Samuel Tilden, and the Stolen Election of 1876. New York: Simon & Schuster.